Their Big Day is here! There is no better way to send your good wishes to the happy couple than with a beautiful design from our Wedding Collection. Our selection of exquisitely designed handmade wedding day cards to celebrate a very special occasion, offering mix of glamorous contemporary and beautiful traditional designs. 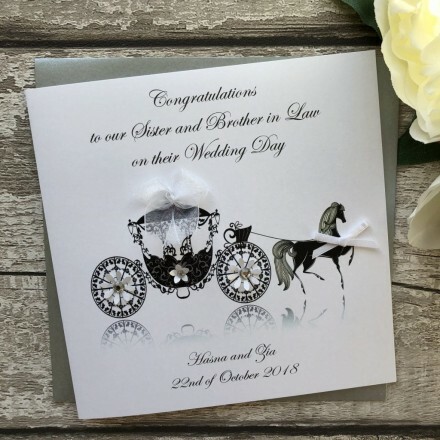 This elegant handmade wedding card design features an image of a horse and carriage and is decorated with sparkling gems and a white chiffon bow. This handmade wedding card is teamed with a matching square envelope, protected in a sealed cellophane bag and sent to you in a double board outer envelope to ensure it arrives in pristine condition.